King Charles I was his own worst enemy. Self-righteous, arrogant, and unscrupulous; he had a penchant for making bad decisions. His troubles began the moment he ascended the throne in 1625 upon the death of his father James I. Charles simultaneously alienated both his subjects and his Parliament, prompting a series of events that ultimately lead to civil war, his own death and the abolition of the English monarchy. Charles' problems revolved around religion and a lack of money. His marriage to the Roman-Catholic French princess Henrietta Maria in 1625 did not please his Protestant subjects and led to suspicions of his motives. In 1637 he totally misgauged the sentiments of his Scottish subjects when he attempted to impose an Anglican form of worship on the predominantly Presbyterian population. Riots escalated to general unrest; forcing Charles to recall Parliament in 1640 in order to acquire the funds necessary to quell the Scottish uprising. This so-called "Short Parliament" refused Charles' financial demands and disbanded after only one month. The continuing civil unrest in the north forced Charles to again convene Parliament in December 1640. The following year the Irish revolted against English rule while the determination of King and Parliament to assert their authority over the other led to open conflict between the two in 1642. "That the king, for the crimes contained in the charge, should be carried back to the place from whence he came, and thence to the place of execution, where his head should be severed from his body." Three days later, the king was led to the scaffold erected at Whitehall, London.
" I go to where no disturbance can be"
"[As for the people,] truly I desire their liberty and freedom as much as anybody whomsoever; but I must tell you that their liberty and freedom consist in having of government, those laws by which their life and their goods may be most their own. It is not for having share in government, sirs; that is nothing pertaining to them; a subject and a sovereign are clear different things. And therefore until they do that, I mean that you do put the people in that liberty, as I say, certainly they will never enjoy themselves. Sirs, it was for this that now I am come here. If I would have given way to an arbitrary way, for to have all laws changed according to the power of the sword, I needed not to have come here; and therefore I tell you (and I pray God it be not laid to your charge) that I am the martyr of the people. . .
Then the king asked the executioner, 'Is my hair well?' And taking off his cloak and George [the jeweled pendant of the Order of the Garter, bearing the figure of St. George], he delivered his George to the bishop. . .
After a very short pause, his Majesty stretching forth his hands, the, executioner at one blow severed his head from his body; which, being held up and showed to the people, was with his body put into a coffin covered with black velvet and carried into his lodging. His blood was taken up by divers persons for different ends: by some as trophies of their villainy; by others as relics of a martyr; and in some hath had the same effect, by the blessing of God, which was often found in his sacred touch when living." The anonymous account of Charles' death appears in Robinson, James Harvey, Readings in European History (1906); Schama, Simon, A History of Britain vol. II (2001); Wedgwood, C. V, A Coffin for King Charles; the Trial and Execution of Charles I (1964). 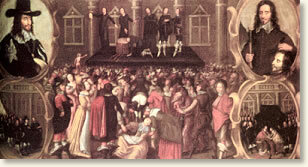 "The Execution of Charles I, 1649," EyeWitness to History, www.eyewitnesstohistory.com (2003). Charles's statue stands at the spot of his execution in London. Flowers of remembrance are still laid at its base by his supporters on the anniversary of his death. Parliament abolished the office of King on February 7. 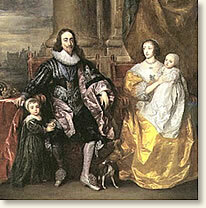 The monarchy was restored in 1660 on the eve of Charles' son (Charles II) ascendancy to the throne.